Kettering Town were forced to settle for a share of the spoils on the road as they drew 1-1 at Banbury United. Lindon Meikle gave the Poppies a first-half lead but the Puritans battled back in the second period and Jefferson Louis’ penalty made it all-square to leave Kettering still sitting in fourth spot in the Evo-Stik South League Premier. Marcus Law made one change to the team that started Saturday’s 2-0 win over Gosport Borough with Rhys Hoenes coming in for Ben Milnes, who wasn’t included in the squad, while former Poppies frontman Elliot Sandy started for the hosts. Banbury were the first to really threaten when a header from a corner was superbly saved by Paul White before Liam Bateman headed the follow-up off the line. And the Poppies took advantage of that let-off to go in with a half-time lead after they had broken the deadlock on 21 minutes. 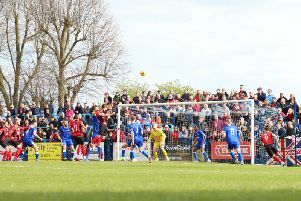 Aaron O’Connor flicked on a free-kick into the box and Meikle was there to score from close-range. The second half was cagey but Kettering were unable to hold on as Banbury levelled from the penalty spot with 13 minutes to go. A clear foul in the area was penalised and Louis stepped up to beat White from 12 yards.